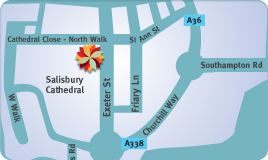 The practice is very easy to find being under St Anne’s Gate at the Exeter Street entrance to The Cathedral Close. There is plenty of parking nearby in the city centre car parks. The Old George Mall car park is only a two minute walk away. Give us a call and we'll talk you through how to find us.